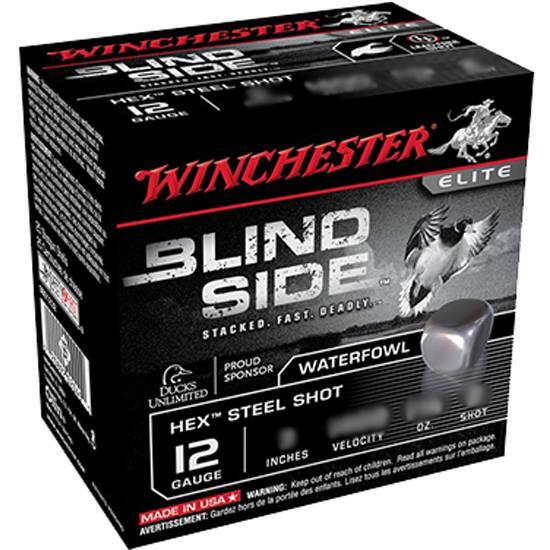 Winchester Ammo SBS12LHV5 Blindside 12 Gauge 3.5 1-3|8 oz 5 Shot 25 Bx| 10 Cs in. Winchester expands its highvelocity lineup with offerings in both 12 and 20 gauge. Higher velocities means shorter leads are necessary for fastflying waterfowl. BlindSide ammunition combines groundbreaking stacked Hex Shot technology with the Diamond Cut Wad in the most deadly Winchester waterfowl load available. The Hex Shot pellets shaped much like dice literally stack together inside the shell. Loaded with 100 percent Hex Shot hunters get more pellets on target a larger kill zone and more traumainducing pellets than ever before. In addition the Drylok Super Steel Wad System keeps powder dry.